Finishing strong our last team to Zambia Oct 26 – Nov 7, 2016 will be Rev. 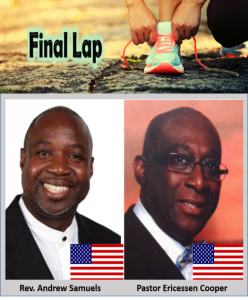 Andrew Samuels (Pastor, Miami SDB, FL) and Pastor Ericessen Cooper (Pastor, New York City SDB, NY), to cover Sabbath Theology and Evangelism (Church Growth & Planting). They will also participate in the graduation exercise to complete this part of the program. The 5K at General Conference for the last two years have been the main support for this program. From this year’s 5K $3,290 has been received.